An article by Bernie Lewin in Watts Up That is worth reading. I cite the particular paragraph below because it lays out the fact that the recent (last 700,000 years ) of earth’s history has been a continuous ice age interrupted by brief interglacials, such as the last 10,000 years. This is called the Quaternary ice age, and we are still in it. My inference from this fact is that humans have much less control over the planet’s climate than the global warming catastrophists would have us believe. And as others have demonstrated, there has been a continuous leaching of CO2 out of the atmosphere for the last 33 million years. Combine these two facts. The earth has experienced increasingly severe ice ages in the last 700,000 years. CO2 has been depleted from the atmosphere for a long time. Some have reasoned that this has accelerated from the time the Indian plate collided with the Asian tectonic plate between 50 and 25 million years ago and pushed up the Himalayas. The action of monsoon rains falling on exposed limestone has had the effect of leaching CO2 from atmosphere, and dissolving it in the oceans. [It is important to note that regardless of the cause of the CO2 depletion, it has been occurring over a vast stretch of time.] Quaternary CO2 levels reached a low of 180 parts per million (PPM). Partly because of human activities, CO2 is back up to over 400 ppm, the highest in the last 800,000 years. This is not the catastrophe that some would have us believe, but a recovery from a low point associated with ice ages. Accordingly, if this association of depleted CO2 and ice ages is correct, then the threat to the planet is cold not heat. So far we are dealing with inferences from observed facts in the geological records. And now to the conjectures. Since humans are adding to the planet’s atmospheric CO2, then perhaps humanity’s function is to keep a recurrence of the next ice age from happening. Rubbish? Teleology? Maybe James Lovelock is right, and that our job as a species is to keep Gaia happy. In either case, we are heading into another ice age, unless the heat that humans are adding to the environment prevent one. And I rather doubt our power to prevent the next big advance of ice, but that is mere conjecture on my part. The one great scientific advance that contributed to the 1970s cooling scare was a revolution in Quaternary geology. Until the late 1960s, it was generally agreed that there had been four recent glaciations, however their timing was largely unknown due to inadequate dating techniques. As the new dating technology was brought into play, it revealed that since the last geometric reversal, around 700,000 years ago, there had been no less than 8 cool/warm cycles. It also showed that cool was the norm. 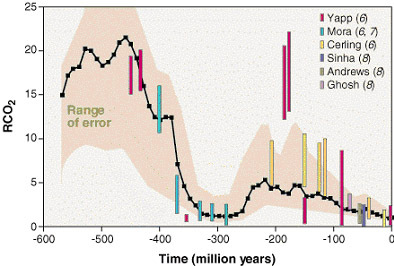 Indeed, the whole Quaternary period (i.e., the last 2.5 million years) is best described as an ice age punctuated by brief ‘interglacial’ warm ‘epochs’. These interglacials appeared like clockwork on a 100,000 cycle, and the record clearly showed that this cycle was about to switch phases. That is to say, the current epoch—the ‘Holocene’, the 10,000 years of warm stable climatic upon which agriculture-based civilization had been built—was about to end. The present interglacial, how and when will it end? Thus it can be seen that the cooling scare—linked as it was with the food and energy crisis—provided the impetus behind the launch of the warming scare, and it also provided the institutional platforms upon which the launch of that scare would take place. there was a good article on that site a month or two ago about paleoclimate changes. it would seem that ice ages are cyclical with or without us around. That is correct, and I doubt that anything we do (such as burn fossil fuels) will stop the advent of the next one. I do not rule out the possibility, but we are such a small force and nature is the concatenation of so much larger ones. Solar output, albedo (reflectivity of the surface) , planetary tilt, distance from sun at solstices, dust, atmospheric gases, shape of the continents, which drives currents, and probably many more.